Planning a great conference requires hard work and experience. Business Communications Worldwide, Inc. offers worldwide event planning services from our headquarters in Hartsdale, New York. A skilled event planner helps you create an unforgettable conference or workshop that's sure to make an impression on your attendees. A strong conference program empowers your workforce and helps your company flourish. We have more than 25 years of experience researching and developing meaningful programs for mid-level and senior executives around the globe. Each program is tailored to your audience and we find presenters on topics of your choice. 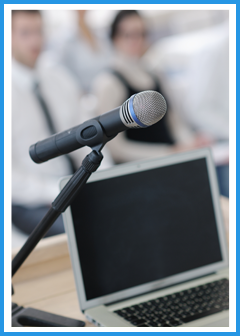 Our team helps you select and invite the most qualified speakers in the field. We even coach speakers on how to deliver meaningful content to audiences of any size. Conferences and events are great sources of revenue. We book corporate and service-oriented sponsors for your event. Attract attendees from all over the world with our promotional services. We create eye-catching materials, including brochures, websites, and email campaigns to help you spread the word. Our media experts also produce webinars and podcasts so you can connect with the widest possible audience. A skilled moderator ensures your panels are valuable and engaging. Our team is available to moderate panels, webinars, and podcasts on your behalf.